Running across this page two days ago from the January 14, 2019, National Enquirer while Net-fishing for Pynchon articles in Lake Google (as I occasionally do during my downtime—yes, having downtime makes me an adult), I thought I’d encountered what the Leader of the Free World has termed “fake news.” First, why hasn’t any other media outlet covered this? And second, why would the celebrity-besotted Enquirer care about that eighty-one-year-old “acclaimed National Book Award winner”, and why would it think its readers do? Then I realized such a reclusive author—“photographed just four times in his 50-plus year career!”—would prove a challenge to a voyeuristic tabloid that exposes everyone famous (except for the abovementioned Leader, though that situation may have changed). 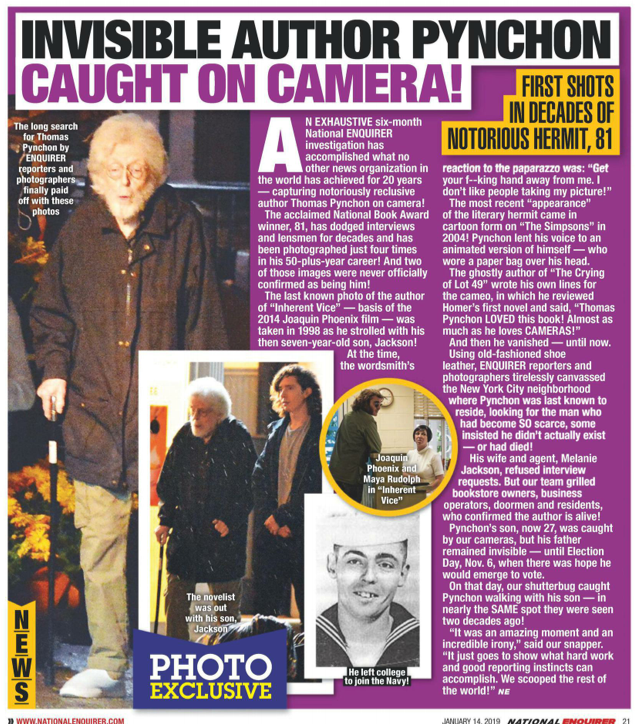 The Enquirer managed to snap at least two pics of Pynchon after he’d apparently “emerge[d] to vote” last November 6 in New York City. He’s definitely aged since his bucktoothed youth and walks with a cane, but he does have a full head of hair. Perhaps the paper’s readers will develop or have already developed an interest in non-mainstream, National Book Award-winning literature, if such an interest will keep them from going bald. And perhaps the other media outlets will get over their jealousy and start acknowledging the Enquirer’s existence; in this privacy-free world, winners snoop first and snoop the most, giving vicarious pleasure to the winners’ promoters and followers, though I assume some Enquirer fans worry about their status as corporate, social-network, and government surveillance targets, since paying attention to Brad Pitt and Angelina Jolie does not necessarily preclude one from also paying attention to civil liberties.